Are we perfect? In one sense yes we are because we are created in the image and likeness of God. If not for original sin, we would be born perfect. 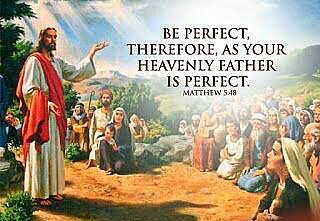 Hence to achieve perfection we must be prefected in Jesus Christ our Lord and saviour. This is how we become a consecrated people unto God our Father. We should always strive for Holiness and perfection but never look to perfection in others. For we are all sinners in need of our Lord’s mercy. And so we are called to be merciful and loving as He is to us.